Pennsauken, NJ, April 16, 2019… Unmanned drones require a variety of sensors to monitor different critical measurements to control flight and maintain aircraft stability. 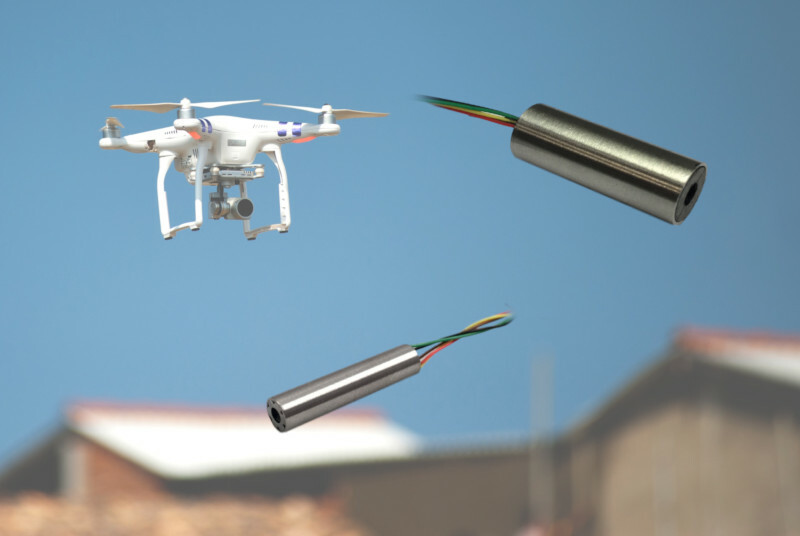 Miniature Linear Position Sensors from NewTek Sensor Solutions provide reliable position feedback for monitoring the fin/rudder position and rotor angle of unmanned aerial vehicles (UAVs) with quick response times so UAVs can make adjustments to accurately control flight. For example, LVDTs deliver position feedback on rudders that control the roll, pitch, and yaw of fixed-wing UAVs. On single rotor UAVs, linear position sensors serve as components in controlling the blade angle of attack. On multi-rotor UAVs used to carry payloads, embedded LVDTs can measure the mass and inertial forces of the transported object. Often, displacement sensors are mechanically linked to an actuator that controls the movement to the flap or mechanical indicator. Flight control systems rely on position feedback information to maneuver the aircraft. NewTek LVDTs can be used on unmanned drones much in the same way. In both manned and unmanned aircraft, weight is always of primary importance to reduce energy consumption or increase the payload. Lightweight and with a low mass core, NewTek Miniature LVDTs meet tight space and weight restrictions. These AC-operated sensors offer high response dynamic measurement with high shock/vibration resistance and long life to survive under the operating conditions on unmanned drones. Stainless steel housings and epoxy encapsulation protects units from environmentally hostile conditions. Based on microelectromechanical technology, the Miniature Linear Displacement Sensors offer high temperature stability, accuracy, repeatability and resolution. In addition to standard operating temperatures of -65°F to +275°F, New Tek offers options for venting up to 30,000 psi and temperature ratings to 400°F. NewTek offers both the M-375 Series (3/8” diameter housing) and M-188 Series (0.188” diameter housing) Miniature LVDTs in measurement ranges from ± 0.01 to ± 1.0 inch. In addition to serving as feedback devices for unmanned drones, these miniature linear displacement sensors deliver position feedback for monitoring fuel/oil levels of airplanes and rudder positions of aircraft carriers, tanks ships and submarines. For more information, visit the website at https://www.newteksensors.com/miniature-lvdts/ or contact Mike Marciante at 856-406-6877 to discuss your application requirements.